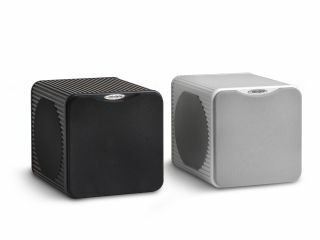 Velodyne has launched its smallest ever subwoofer. Measuring just 22cm round the edges, the little box takes the rules of physics and bends them to an extreme degree. Veldoyne snubs the time-honoured subwoofer logic that to deliver big bass you need a big cabinet. It uses some clever technology to enable the MicroVee to punch well above its modest dimensions. Lurking inside the cabinet is the latest generation of Velodyne's patented digital amplifier, capable of a hefty 1,200 watts of dynamic power. Complimenting this is the MicroVee's triple-driver system. One powered 6.5inch driver unites with a pair of equally-sized passive drivers - the trio creating powerful yet beautifully defined bass notes. The MicroVee will be available in the UK from September 2007, and is expected to retail at £575.